In case any of you thought I was serious, I know that the little bit of wind-driven sleet and snow we got yesterday doesn't qualify as a blizzard. But it was cold, for me and for Lisa, and for our resident rabbits. During one of the semi-sunny breaks, I went out to have a look, as Amtrak was supposed to be coming by about then. 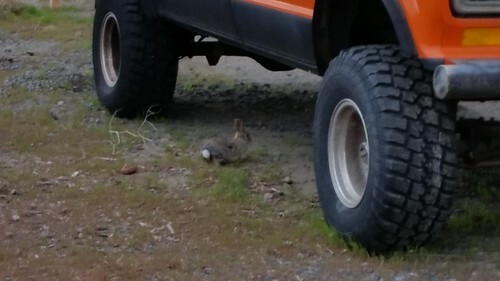 I startled one of the rabbits, which ran under the Big Orange Van and huddled there trying, I suppose, to stay out of the wind, without much success. 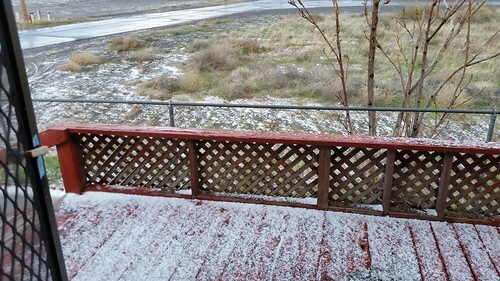 A few minutes later, the snow/sleet returned and by then it was cold enough for some of it to stick on unpaved surfaces like our porch. The bunny ran off, presumably heading for a warm burrow. This morning, there were a few sheltered spots with a bit of leftover ice, but by mid-day it was all gone. The next few days are forecast to be clear and brisk, but above freezing. That's good, because we have some spring work around the property that we would like to get started on doing. Spring is one of the times of the year when we can get things done because it's neither too hot nor too cold.